When you own a PC, laptop or even a smartphone or a tablet that runs on any operating system that is available at present, you also need to be ready for the worst. No matter how good your PC, laptop or mobile device performs, it would still fall into problems in the long run and the worst can happen when you can no longer log in to your machine or it refuses to boot up properly after it has been infected by a strong virus. When this happens, most of us would just resort to doing a reformat or clean install process which sacrifices all important stuff that has been saved in your machine’s hard drive in case you did not save backup copies of them or if you didn’t save them on a separate hard disk partition. But even after doing the latter, you’ll still have problems if the files in it were infected or corrupted by the virus itself. In this situation, unknowing users would really do a clean install process but as you will see in this tutorial, there is actually a better solution to this worst problem that does not need totally cleaning and clearing your machine in an attempt to remove the viruses along which deletes all your important files that took years to collect and compile. This solution will take advantage of a tool called “System Restore” found under the “Advanced Boot Options”. If you are curious what solution we are talking about and want to know how you can actually take advantage of it then be sure to get your Windows machine ready and follow the steps that we’re going to demonstrate in this tutorial. Since most Windows users have already upgraded to Windows 10 and that includes us although we still have test computers running on Windows 7 and Windows 8.1, most of the screenshots and steps that we’re going to show below are taken from Windows 10 with the Anniversary Update installed to it. In other words, it is already on Windows 10 Build 14367. If you are still using an older build then you might notice some differences in the appearance and layout of icons, menus and options in certain parts but the process remains basically the same so you can simply follow the steps as we move along. 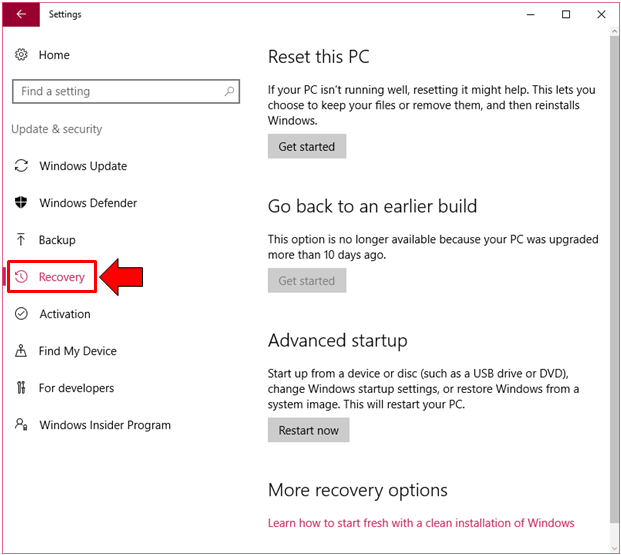 In order to access and use the System Restore tool that is available in your Windows 10 machine, you will first need to get into the Advanced Boot Options and in order to get into that, the universal Settings app must first be launched. There are many ways in doing this and we’ll show the easiest one first. To launch the universal Settings app quickly on your computer screen, all you need to do is press on the Windows + I keyboard shortcut combination and the Settings app Window will instantly open. 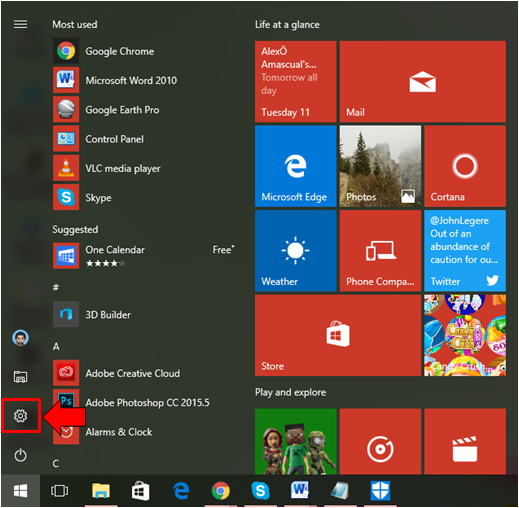 Another method that you can use in launching the universal Settings app Window is done by clicking on its icon that is found on the left-hand portion of the Start Menu so go ahead and launch the menu by pressing on the Windows key or clicking on the Start Button and once it opens, simply click the Settings icon which is seated on a narrow bar at the left as you can see being highlighted on the screenshot below. The universal Settings app Window will then launch and from here, you will see its home screen where you will need to click on the category that says “Update & security”. 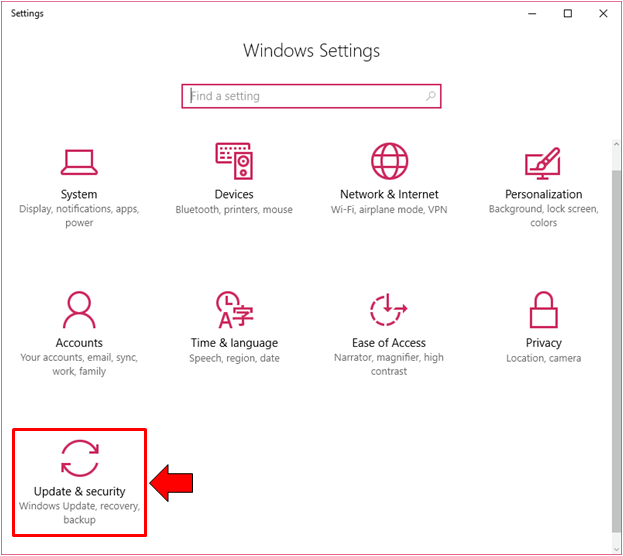 The contents of the “Update & security” settings category will then open and from here, you will need to click on the link that is found on the navigation pane at the left which says “Recovery” as you can see below. This is where the Advanced Boot Options are found and this is the starting point that will lead us to the trick that we want to show to you in this tutorial. Fixing errors and problems that cause Windows 10 to behave abnormally is easier when you can still access and log in to your computer. If this is the case with the machine that you are having problems with right now then you can simply access the Advanced Boot Options which is labeled “Advanced startup” in the “Update & security > Recovery” section of the universal Settings app as we have accessed above. 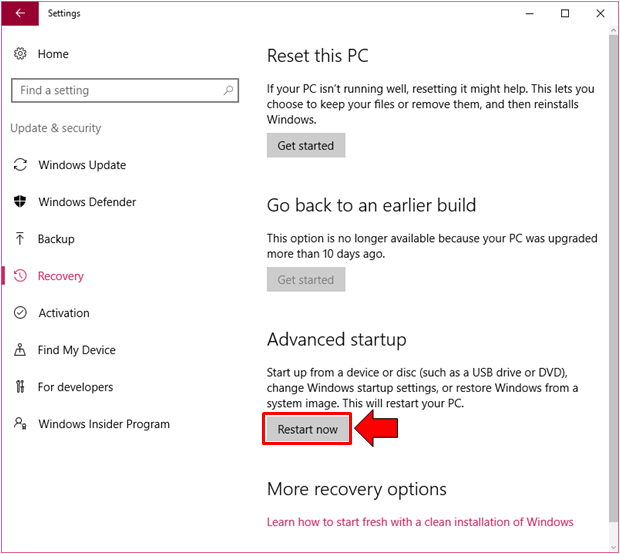 Under this option of the “Recovery” section, you will see a button that is labeled “Restart now”. Before clicking on this button, you will first need to make sure that all the file or any other task that you are currently doing on your computer is saved so as to prevent them from getting lost. Once you are ready with them, you can click the “Restart now” button and your machine will automatically reboot. Once your device reboots you will then be taken to screen that looks exactly like the one shown below with a big instruction that says “Choose an option”. 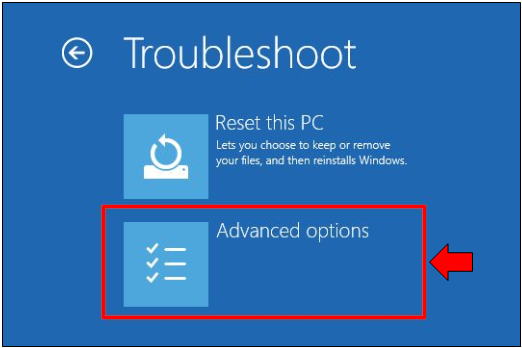 From here, you can see three options which are “Continue”, “Troubleshoot” and “Turn off your PC” and in order to access the “Advanced Boot Options”, all you need to do is click on the second option that is labeled “Troubleshoot” as shown below. After clicking on the “Troubleshoot” option, you should then be taken to the next screen which will now show even more choices for repairing and restoring your computer to its good working condition. From here, all you need to do is click on the third option which says “Advanced options” as you can see on the screenshot below. Once you are done clicking on the option, you will now be able to open the options under it which are actually tools that are available for repairing your machine depending on the problem that it currently has. 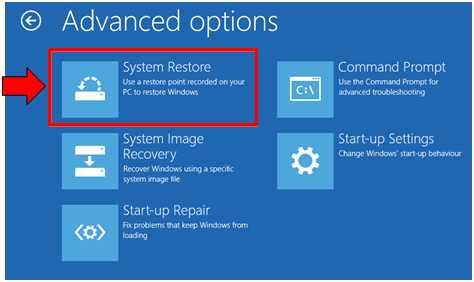 From here, you will simply need to click on the “System Restore” tool as highlighted below. Windows 10 will then take some time to prepare the System Restore tool and once it is ready, you will be taken to a screen that asks you to select an account to which you want to log into, after clicking the account name, just enter the password on the Window that follows then hit the “Continue” button at the bottom-right portion. After you do so, the System Restore tool will then launch and allow you to repair your computer. Take note though that you need to have a restore point created before you do this repair attempt. If you don’t know yet how to create a Restore point in your Windows 10 computer, you can find the instructions in creating it on our next tutorial so be sure to catch it fresh by signing up for our newsletter. Now, aside from being able to access the System Restore tool from the universal Settings app in case your computer is still manageable and you can still open and log in to it, there is also a way for using this same tool when the worst happens to your machine and you can no longer login to it because of virus intrusion and other sorts of infection caused by malware. 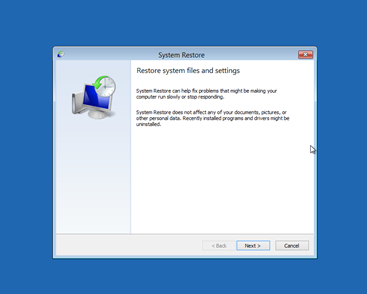 In order to access and use System Restore even in this worst case scenario, you will first need to create a Recovery Drive as what we have shown in our previous tutorial. Once you have the Recovery Drive, you can boot your Windows computer with it and the process will be the same as the one that we’ve shown above. The first screen looks like the one that is shown below and from here, you will need to click the option that says “Troubleshoot”. On the screen that follows, you will need to click on the item that says “Advanced options” and you will be able to see the different tools that are available for repairing your computer as you can see being highlighted on the screenshot below. On the next screen, you will need to click on the item that says “System Restore” as shown on the screenshot below and Windows 10 will automatically look for a restore point from the USB Drive that you used and created as Recovery Drive. 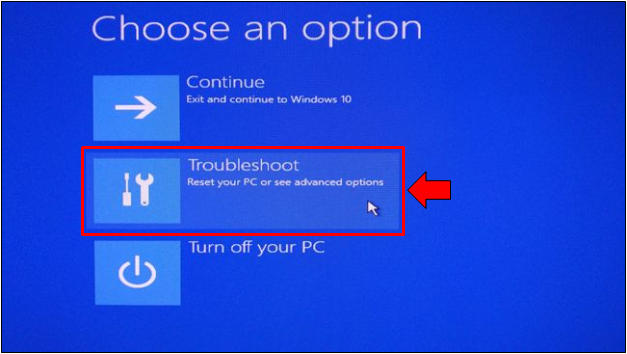 The next steps will just be the same as the ones that were involved in using System Restore when you can still login to your Windows 10 machine as we have shown above so just follow them until the very last step and your computer should be fixed depending on the veracity of the problem. The System Restore tool should inform you that the repair process has been successful and once you see this prompt, you can reboot your machine and see if it already works smoothly. As you can see, Windows 10 as well as older Windows operating system versions actually has a tool that will help you restore your computer to a good working condition without sacrificing the files that has accumulated for a long time. Just be sure to create a System Restore point or create a Recovery Drive so you can have a tool that you carry around with you wherever you go and you’ll always be ready for the worst! Have you even suffered a serious problem on your Windows computer? What did you do with it and how was it solved? Did you use a built-in or third party tool in fixing it? We’d like to hear your side so if you do have answers to the preceding questions that we have then please feel free to post your answers as comments below.